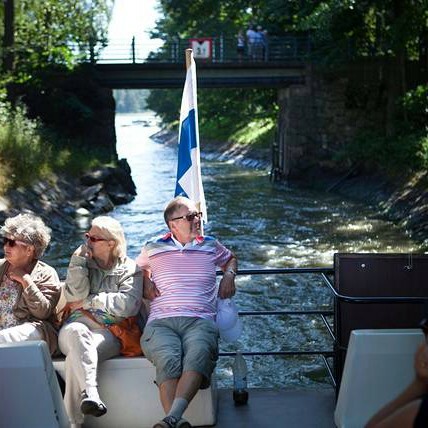 Suomen Saaristokuljetus Oy operates Helsinki’s most gorgeous archipelago route between Hakaniemi and Vuosaari from the beginning of June until the end of August. The Eastern archipelago route is the only water route in Helsinki which takes you from mainland to mainland and gives you an excellent view into the everyday life in the archipelago. The duration of the cruise is 1 hour 45 minutes. During you trip you will get to see parts of the archipelago unaccessible to other routed watertraffic or sightseeing boats. The route passes through the Degerö canal. Why don’t you spend a fantastic day on board and hop on from Hakaniemi for a cup of coffee in Vuosaari? How about a day admiring nature in Vartiosaari? You see a video of the route by clicking here and find the addresses of the piers here. Choose your port of departure by clicking on it and check the price of your journey next to your destination. Series tickets are availble and are sold on the boat. The tickets are for personal use only, and will written out the name of the buyer. More information from the boat, by email or calling the customer service! Cash, Finnish debit cards, and most common credit cards are accepted as a means of payment on board. Whan paying by cash, please reserve exact change! There’s a cafe on board. Big and heavy items (also luggage) and bicycles will be charged 2 € extra. Children’s prams are welcome on board for free. Please note the the departure times in the schedule might vary by +/-5 minutes – please be ready to board the boat well in advance.